.45 GAP (Glock Automatic Pistol) ammunition was developed for the Glock 37 and is intended to be more compact and stronger than the .45 ACP when fired in Glock pistols. It was introduced in 2003 by CCI/Speer of Lewiston, Idaho. 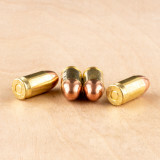 .45 GAP loads come in 185, 200, and 230 grain bullet weights. The lighter projectiles produce higher muzzle velocity in order to achieve more reliable expansion and reduce the risk of overpenetration. Law enforcement agencies using .45 GAP handguns include the state police forces or highway patrols of New York, Georgia, South Carolina, and Florida. Civilians will find both range training and expanding self-defense loads for sale here at Widener's from brands like Federal, PMC, and Winchester. 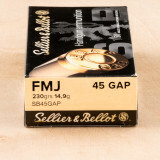 This 500 round case of .45 GAP ammunition offers plenty of trigger time for your Glock 37/38/39 at a reasonable price. 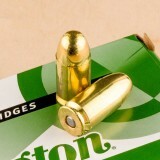 Note that this is .45 GAP ammo, which is not interchangeable with .45 Colt or .45 ACP. 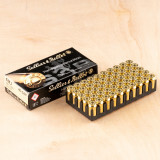 Each cartridge in these 50 round boxes (10 boxes per case) fires a 230 grain full metal jacket bullet at a muzzle velocity of 880 feet per second. 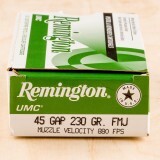 Remington UMC ammo is loaded in Lonoke, Arkansas and uses reloadable brass and non-corrosive Boxer primers. 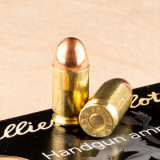 These rounds from Sellier & Bellot (S&B) are great for practice with your .45 GAP chambered Glocks, XDs, and 1911s. These cartridges use standard 230 grain full metal jacket (FMJ) projectiles, reloadable brass casings, and non-corrosive Boxer primers that are enhanced with sealant to resist moisture which could cause malfunctions. Sellier & Bellot is a Brazilian-owned Czech company with over 190 years of experience making high quality ammunition for military use, local shooting teams, and international export. 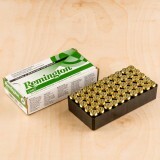 You can find versatile ammunition for your handgun by ordering this 50-round box of .45 GAP ammo from Remington, one of the nation’s most historic ammunition brands. These 230-grain cartridges can be used for target shooting, hunting, and even personal defense, giving you the complete package of performance and versatility. The 230-grain bullets come out of the barrel with a muzzle velocity of 880 feet per second and a muzzle energy of 395 foot pounds. They also maintain excellent ballistics downrange; at 50 yards, they still have 841 feet per second of velocity and 361 foot pounds of energy. 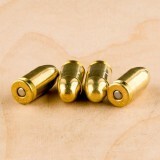 This makes them a great option for distance handgun target shooting and training. Remington is one of the most historic companies in America. Since 1816, this ammunition and firearms manufacturer has been providing superior products for many different purposes. From the great outdoors to indoor target ranges, Remington provides quality and consistency.